Rodney Bradford comes into Lindsay's restaurant, offers to buy her small house for double its value, eats her brownies, and drops dead on the sidewalk in front. Then someone breaks into her house and tries to dig up her basement. Next her almost-ex-husband offers to sign the divorce papers, but only if she'll give him her small, old house and take his big, new house instead. Suddenly everybody wants Lindsay's house. Is there oil under the basement, plans to bring the railroad through, pirate treasure buried in the basement? A second break-in occurs and causes her cat, King Henry, to launch into full attack mode, taking a few chunks out of the intruder. Lindsay enlists the aid of her enigmatic neighbor, Fred, to help solve the mystery while trying to keep her police detective boyfriend, Trent, from getting in their way with his insistence on all those silly cop rules. On the positive side, sales skyrocket for the special dessert Lindsay calls Murdered Man's Brownies. Prisoners, murderers, crazy relatives and strippers are all part of the chaos in this second book of the Death by Chocolate series. BONUS! Chocolate recipes at the end of the book. Poison optional. Sally Berneathy writes some of the best cozy mysteries I have ever read. Her ability to make me laugh out loud on several occasions alone makes this book worthy of 5 stars. However, there's so much more. Murder, Lies and Chocolate has a great plot, romance, and decadent recipes that you're going to love. 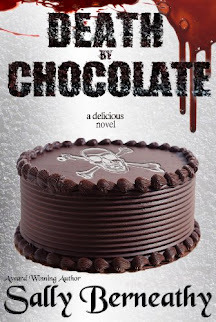 If you're looking for an awesome cozy mystery series, Death by Chocolate is not to be missed!